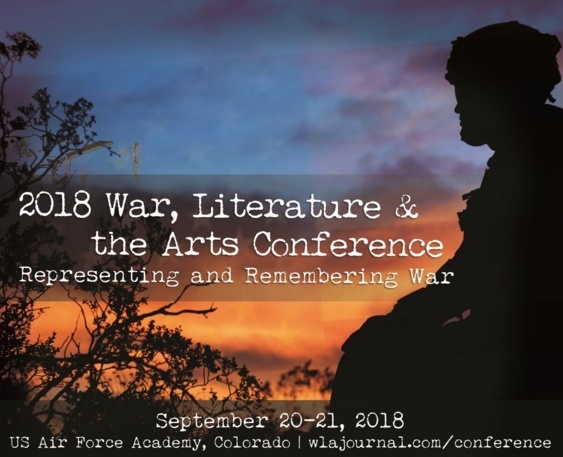 Editors of War, Literature, and the Arts Journal recently solicited 300-word proposals for presentations on "Representing and Remembering War," an event to be held Sept. 20-21, 2018 on the U.S. Air Force Academy's campus near Colorado Springs, Colo. The event commemorates the 30th Anniversary for the journal, which was first published in Spring 1989. Organizers seek 300-word abstracts regarding both disciplinary and interdisciplinary approaches to the conference topic. Panels of three or four presenters per 90-minute block are acceptable. Deadline for abstracts is Dec. 15, 2017. Responses will be forthcoming not later than Feb. 1, 2018. The conference seeks a variety of genre submissions, both critical and creative, including literary criticism, journalism, rhetorical analysis, cultural studies, theory, fiction, non-fiction, poetry, film studies, photography, painting, and music. As an international forum on the cultural implications of warfare, the conference is designed to bring together a multitude of perspectives, critical approaches, and discourse communities on the topics of warfare and its representations across all time periods and conflicts. We encourage submissions that illuminate, challenge, deconstruct, engage with, or create not simply the "official" representations of wars, but the sub-cultures that merit a more nuanced or sophisticated intellectual exploration. Keynote speakers scheduled for the event are Suzan-Lori Parks and Robert Olen Butler.